Choctaw Nation Regional Health Clinic in Durant, Oklahoma: Healthcare, $50 million to $100 million category. Built upon what was previously pastureland, Choctaw Nation Regional Medical Clinic’s three-building campus consists of a two-story, 146,093-square-foot main clinic, a smaller one-story, 16,108-square-foot health service administration building and an 11,750-square-foot facilities building, all connected externally by a network of canopied sidewalks. As the centerpiece of the 20-acre, $73 million campus-style development, the clinic is fundamentally a hospital, but devoid of the overnight accommodations. 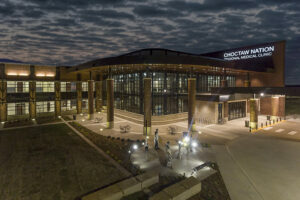 Complete with various departments such as outpatient surgery, dental and audiology, ophthalmology, and behavioral health, the 146,093-square-foot facility perfectly captures the spirituality, passion, and history of the Choctaw tribe. Ultimately, some 260,000 members of the Choctaw and other tribes will be serviced by the clinic, part of a tribal-wide program to provide medical clinics in different geographic areas. Robins & Morton also receive an additional Productivity Award for utilizing innovative productivity methods on this project. Duke University Medical Center Cardiac Intensive Care Unit and Infrastructure Upgrade in Durham, North Carolina: Healthcare $5million to $10 million category. 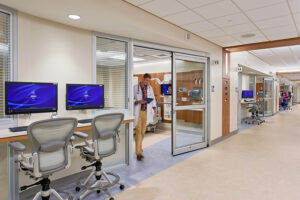 As part of a comprehensive, multi-year transformation initiative, Duke administrators contracted with Robins & Morton to plan and construct a full-scale renovation and infrastructure upgrade for a new Cardiac Intensive Care Unit (CICU). The 17-bed CICU is the most sophisticated and technology-enabled cardiac care facility in the region. It is located within the main Duke University Medical Center in Durham, North Carolina – an institution consistently ranked among the top hospitals in the U.S. for treating heart disease. Robins & Morton also received a Pyramid award for Wofford College’s Rosalind Sallenger Richardson Center for the arts. Wofford College Rosalind Sallenger Richardson Center for the Arts in Spartanburg, South Carolina: Institutional, $25 million to $100 million category. 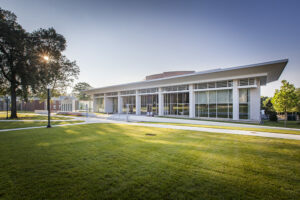 The Rosalind Sallenger Richardson Center for the Arts, located at the academic center of the Wofford College campus, is the college’s first building dedicated specifically to performing arts and fine arts programs. The 65,000-square-foot center includes specialized classroom, studio, rehearsal and exhibition spaces for the Department of Theatre and the Department of Art and Art History. It features two performance theaters: the 320-seat Jerome Johnson Richardson Theatre and the Sallenger Sisters Black Box Theatre. The Richardson Family Art Museum and the Richardson Family Art Gallery showcase permanent art and artifacts collections, student artwork and works by visiting artists. In addition to the three national awards, Robins & Morton also took home 16 Excellence and Merit Awards from the Associated Builders and Contractors of Alabama, North Alabama, Greater Tennessee, Central Florida, Florida East Coast and Carolinas chapters.